Massively Open Online Courses are becoming more mainstream, as more top-tier universities give the public access to their courses. A new study demonstrates continued wide-spread popularity with part-time students looking to substitute otherwise cat-video-filled downtime with ivy league lectures. Examining public data from 279 courses from the most popular MOOC providers (Udacity, Coursera, edX), researcher Katy Jordan finds that the average course enrolls about 43,000 students. About 6.5% of those stick around ’til the end. 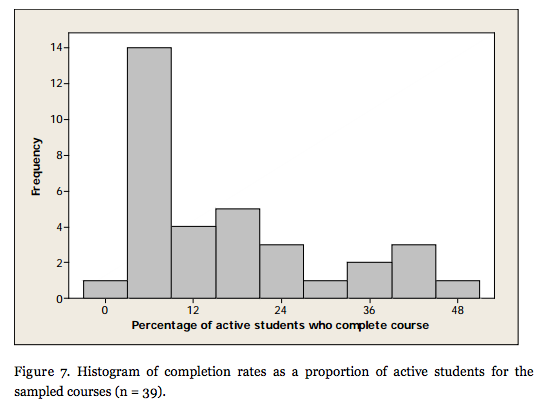 When looking at the number of students who engaged at least a little bit with course materials, the number of completion jumps to 9.8%. 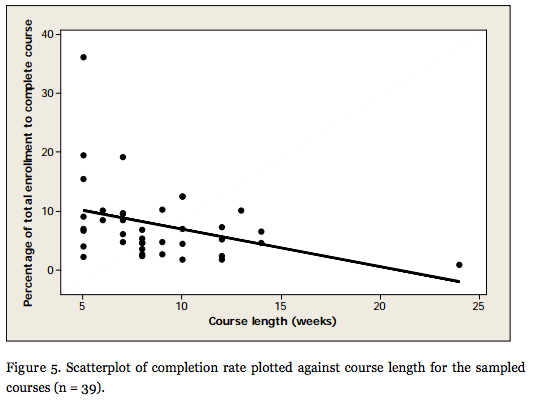 Interestingly enough, Jordan finds that one of the greatest predictors of course completion is course length. That is, students aren’t necessarily sticking around for a hotshot professor, big name school, or even the value of the material. The graph below gives us a good hint that MOOCs are still a part-time activity for most users. Integrating MOOCs into the official university process has been trickier. San Jose State University had mixed results with a purely online MOOC for college credit. However, a hybrid model, which combined online lectures and face-to-face class time, did significantly improve pass rates for engineers. Still, 5-figure enrollment of voluntary learning is nothing to scoff at, and MOOCs are proving that they can realize one of the big promises of the Internet: mass education. You can read the full results of the study here.